WORCESTER, Mass. – When undefeated prospect Edwin “La Bomba” Rodriguez drilled veteran George “The Rooster” Armenta with a lethal left hook to the body, stopping their ESPN Friday Night Fights bout at 47-seconds of the opening round, many boxing fans had memories of another New England boxer famous for his left hook, “Irish” Micky Ward. 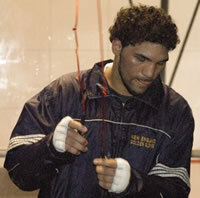 Rodriguez (14-0, 10 KOs), fighting out of Worcester (MA), made his nationally televised debut March 19 against Armenta (13-6, 11 KOs), who had knocked out 2000 U.S. Olympian Dante Craig and extended current WBA light middleweight champion Yuri Foreman and top contender Sechew Powell the full distance. Armenta had never been floored before, never mind stopped, until he was cracked by the Dominican Republic-born super middleweight Rodriguez. Rodriguez, the 2005 USA Boxing National Championships and 2006 U.S. National Golden Gloves Tournament gold medalist, will be back in action April 30 against Kevin Engel (17-2, 14 KOs). Edwin will be fighting for the first time on a ShoBox: The New Generation card in an 8-round co-feature. Rodriguez is promoted by DiBella Entertainment, managed by Elite Management (Larry Army), and trained by Peter Manfredo, Sr. Go online to www.edwinrodriguezboxing.com for more information about Edwin and his team.